Bird Studies Canada is seeking a highly motivated and skilled person to coordinate the programs and day to day operation of the Long Point Bird Observatory. This includes the Migration Monitoring Program, Young Ornithologists’ Workshop/Internship, Tree Swallow Project, Breeding Bird Census Project, Latin American Training Program, facilitating and conducting collaborative research projects, and the operation and maintenance of three research stations and associated equipment. This is a permanent position. The position is well suited for someone who is an excellent birder and naturalist and loves working outdoors and coordinating and doing fieldwork, enjoys excellent physical health, is very well organized, demonstrates initiative, and has an exceptional work ethic and interpersonal skills. The starting monthly wage will be $3000-3500 CDN (plus health and dental benefits) depending on qualifications and experience. Costs of field food, accommodation, and travel are provided. Bird Studies Canada welcomes and encourages applications from people with disabilities. Accommodations are available on request for candidates taking part in all aspects of the selection process. We are looking for applicants with the following qualifications and skills: Excellent bird identification skills by sight and sound. Knowledge and enjoyment of all other aspects of natural history. Excellent working knowledge of migration for all taxa, specifically landbirds, stopover ecology and conservation, bird monitoring techniques (censusing, counting and estimating, banding), and following standardized field protocols. Previous banding (at least 5000 birds banded of ~100 species) and bander training experience with a strong emphasis on passerines is required. Experience working or volunteering at a migration monitoring station, or similar research/field station. Certification as a Bander or Trainer by the North American Banding Council is highly desirable. Comfortable with public speaking and guiding. A BSc. in biology (or exceptional field experience). Strong leadership and mentoring skills needed to oversee a large cadre of volunteers and seasonal field staff and take charge of a major research and monitoring operation. Canoe, motorboat, and 4×4 experience, driver’s license, basic handy-person skills and an excellent working knowledge of windows-based computer programs. Analytic and writing skills are also highly desirable. To apply: Please submit a cover letter, resume (including names, phone numbers and e-mail addresses of 3 references) to: Stuart Mackenzie, Migration Program Manager, Bird Studies Canada – Long Point Bird Observatory. 519-586-3531<tel:519-586-3531>(x 162); Fax: 519-586-3532<tel:519-586-3532>; Email: smackenzie@birdscanada.org . Visit our web site at www.birdscanada.org/lpbo to learn more about LPBO and BSC. Closing date for competition: 30 June 2018. Only eligible candidates will be contacted. The Long Point Bird Observatory has begun to develop a series of short instructional videos covering basic to advanced aspects of bird monitoring. I'll post them here as more are developed and/or changes are made, and I will post a permanent location at a later date. For now they are hidden from public viewing, but feel free to circulate widely to anyone that would benefit. The first installment of the LPBO Technical series tackles the very simple but integral skill of tying a mist net pole. There is of course many ways to tie a net pole, but this video shows a method used for decades at LPBO. I'm still not entirely sure of the exact origin or designer of the knot and I'm sure other variations exist. Enjoy and comments are welcome. [media=] [/media] Safe and productive banding. Stu ______________________________________________________________________________ Stuart A. Mackenzie LPBO Program Coordinator Long Point Bird Observatory - Bird Studies Canada/Etudes d'Oiseaux Canada PO Box 160, 115 Front Rd. Port Rowan, Ontario. N0E 1M0. Office:(519)-586-3531 X 162 Fax:586-3532 Old Cut:586-2885 Mobile:820-6040 smackenzie@birdscanada.org http://www.birdscanada.org/longpoint http://www.facebook....birdobservatory Support LPBO by sponsoring us in the Baillie Birdathon!!! click here. 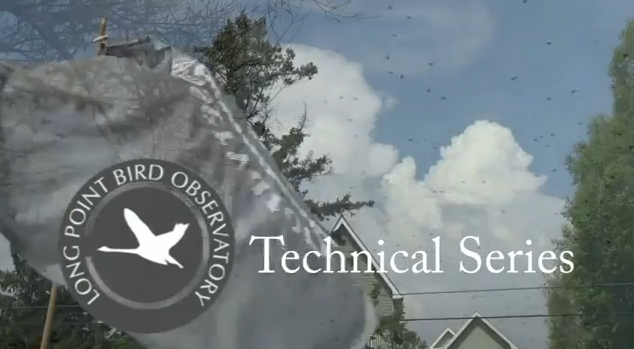 The Long Point Bird Observatory has begun to develop a series of short instructional videos covering basic to advanced aspects of bird monitoring. I'll post them here as more are developed and/or changes are made, and I will post a permanent location at a later date. For now they are hidden from public viewing, but feel free to circulate widely to anyone that would benefit. The first installment of the LPBO Technical series tackles the very simple but integral skill of tying a mist net pole. There are of course many ways to tie a net pole, but this video shows a method used for decades at LPBO. I'm still not entirely sure of the exact origin or designer of the knot and I'm sure other variations exist. Enjoy and comments are welcome. [media=] [/media] Safe and productive banding. Stu ______________________________________________________________________________ Stuart A. Mackenzie LPBO Program Coordinator Long Point Bird Observatory - Bird Studies Canada/Etudes d'Oiseaux Canada PO Box 160, 115 Front Rd. Port Rowan, Ontario. N0E 1M0. Office:(519)-586-3531 X 162 Fax:586-3532 Old Cut:586-2885 Mobile:820-6040 smackenzie@birdscanada.org http://www.birdscanada.org/longpoint http://www.facebook....birdobservatory Support LPBO by sponsoring us in the Baillie Birdathon!!! click here.